In the middle of the 19th century, it was accepted that only three variables, in other words three receptors, are required to explain the colour mixing which formed the basis of experiments carried out by both James Maxwell in 1867 and Hermann von Helmholtz in 1859. Modern physiologists can confirm only that three types of molecule (photo-receptors) exist, and that each type is particularly sensitive to either short, medium and long waves. Although this observation can help explain why a few wavebands of incident light cannot be distinguished from others and thus why many mixtures result in the same colours, we are nevertheless unable to explain those colour-hues which we can see. Although he also spent considerable time investigating the eye’s perception of three-dimensional space, Hering was more concerned with the introspective aspects of colours. His work on colour refers to the problem ofyellow in the three-colour system, for example. According to Helmholtz, yellow was of necessity produced from a mixture of red and green, but this — so Hering realised — was not in line with human experience. The sensation of yellow is elementary, and not traceable to a mixture. Hering further states that mixtures of red and green never occur, but eliminate each other. A red-green is simply inconceivable. In the case of opponent-colours, which account for all colour-hues of the visible spectrum, Hering also speaks of «antagonistic types of light…which together produce white». That means «they do not complement each other to form white; they merely allow white to occur as pure because, as antagonists, they render each other’s effect impossible». White was for him «a sensation of its own nature, in the same way as black, red, green, yellow or blue». Hering therefore additionally proposed a white-black opponent-process in order to cater for brightness. 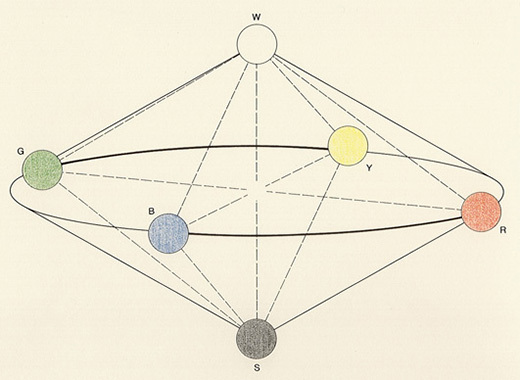 There are thus six basic colour-hues in all. Hering expressively distanced his Theory of the Sensitivity of Light from the world of physics. To Hering, the claim that red and green or blue and yellow together give white would «only make sense if red and green are understood as oscillations of the ether, and not red and green sensations». Experiments using test-subjects to describe an impression of coloured light now confirm Hering’s opponent-theory convincingly; four expressions — red, green, yellow and blue — were available to the early pioneers, and they were able to describe each colour using suitable combinations of these terms. 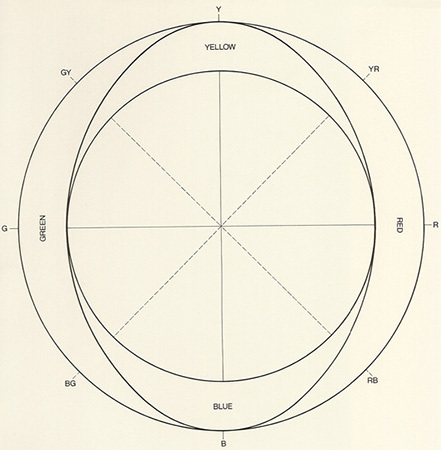 There are in fact four (and not three) fundamental colour-hues (the neurophysiological proof has been available since 1966, but we shall look into this elsewhere) and these are placed opposite each other in Hering’s system, which is a circle of opponent rings and ellipses. This has been reproduced here with its four basic colours of yellow (Y), red (R), blue (B) and green (G) arranged at right angles to one another. The broken lines refer to mixtures at a ratio of 50:50: yellow-red (YR), red-blue (RB), blue-green (BG) and green-yellow (GY). To the lower right, we have stretched the opponent-circle out into a strip. 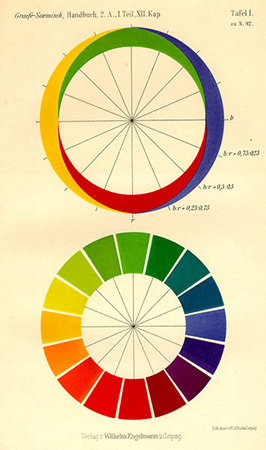 Hering’s order of colours, which he described as «the natural system of colour sensations», forms the basis of a system nowadays known by the three letters NCS, i.e. the «Natural Colour System». 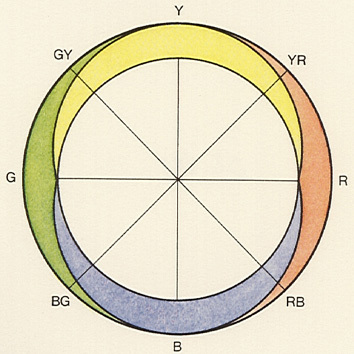 The succession of the colour-circle shows the position of the four «elementary» colours, and the proportions with which any two elementary colours can form mixtures. Hering’s opponent-theory was not accepted, being criticised chiefly by students of Helmholtz who argued that Hering’s proposal only made sense if two different processes existed within the nervous system: namely: stimulating and moderating processes. In Hering’s day, the kind of knowledge which we now take for granted had still to be acquired and subjected to proof. Nevertheless, our perception of colours is no clearer, but we shouldn’t allow that to spoil our enjoyment of them. Date: In 1878, the physiologist Ewald Hering published his On the Theory of Sensibility to Light in Vienna, which opposed the purely phenomenal or physical understanding of colours. Bibliography: E. Hering, «Zur Lehre vom Lichtsinn» (illustration), Vienna 1878; G. A. 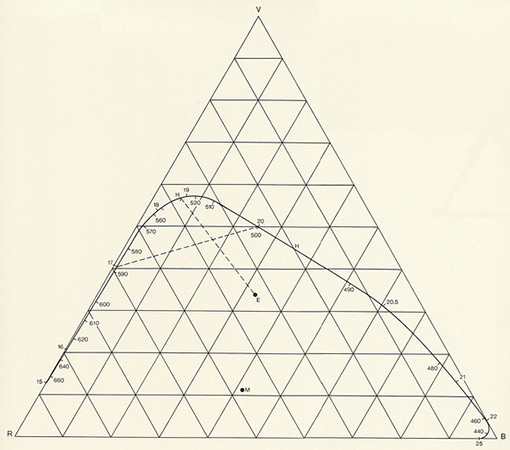 «Agoston Color Theory and Its Application in Art and Design», Heidelberg 1979; S. Hesselgren, «Why Colour Order Systems?», Color Research and Application 9, pp. 220 – 226 (1984).